1. In the Deformation toolbar, enable the Setup Mode . 2. Once you have created a Bone and Articulation or Curve deformation chain, in the Network view, navigate to your deformer module, inside the element’s Deformation Group and inside the pose subgroup if applicable. 3. Click on the deformer module’s square yellow button to open the Layer Properties dialog box. 4. 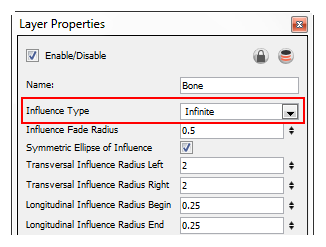 In the deformer Layer Properties, use the Influence Type drop-down menu to select the type of Zone of Influence you want. ‣ Zero Influence: The Zone of Influence does not exist. No deformation will happen. ‣ Infinite Influence: This is the option selected by default and is the most commonly used. The Zone of Influence has no boundary and covers the whole element to which the deformer is linked to and its children, excluding areas that are already part of another elliptic or shaped Zone of Influence. The Infinite influence zone will from the center of your skeleton, going toward infinity, working in perpendicular with the skeleton. This is the recommended Zone type for a cut-out puppet assembled from several element layers. ‣ Elliptic Influence: The Zone of Influence boundary is defined by an elliptical shape whose size can be customized using the Bone, Articulation or Curve module properties or by using the Transform tool. The Elliptic Influence will most likely be used on a bitmap picture you wish to deform. ‣ Shaped Influence: The Zone of Influence boundary is defined by a shape which you can customize using the Transform tool. The Elliptic Influence will most likely be used on a bitmap picture you wish to deform. 5. 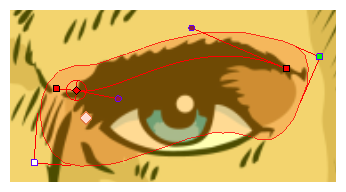 When you select the Elliptic or Shaped type, the Zone of Influence appears in the Camera view where you can customize the shape using the Transform tool and Layer Properties options. This example illustrates the Zones of Influence of a Curve deformer. Note that this example also applies to the Bone and Articulation deformers. You can also use the Convert Elliptic Deformation ROI to Shape function in order to convert your Elliptic zone of influence to a shape. In the top menu, select Animation > Deformation > Convert Elliptic Deformation ROI to Shape. 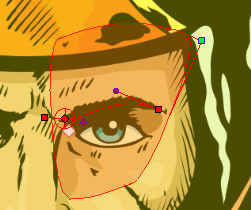 This function will create a much smaller initial zone of influence than if you were to convert it directly to a shape.